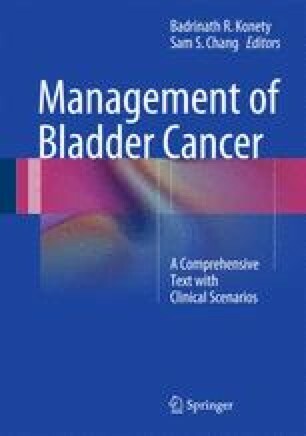 Approximately half of all newly diagnosed cases of bladder cancer are non-muscle-invasive tumors confined to the urothelial lining of the bladder (Ta). The vast majority of these (>90 %) will be low grade. Although these tumors carry a low risk of progression to invasion (5–10 %) and an even lower risk of death (1–5 %), they have a very high likelihood of recurrence (50–70 %). Patients with large volume and rapidly recurring low-grade Ta bladder cancer present a significant treatment challenge for the urologist. Intravesical chemotherapy has been shown to decrease the recurrence rate of these tumors, though the optimal agent, dose and treatment schedule has not been determined. Intravesical BCG can be used if intravesical chemotherapy is not successful, or in cases where the risk of recurrence is high. However, BCG has a significantly higher rate of local and systemic toxicity. Other chemotherapeutic agents are currently being investigated as intravesical therapies. Active surveillance with frequent office cystoscopy and fulguration of any small recurrences is also an option. In rare instances, patients who undergo grade or stage progression or those who fail to respond to the above treatments may ultimately require radical cystectomy.